Climbing shoe demo evenings at Big Rock. In the market for some new climbing shoes? Or just keen to check out the latest tech? 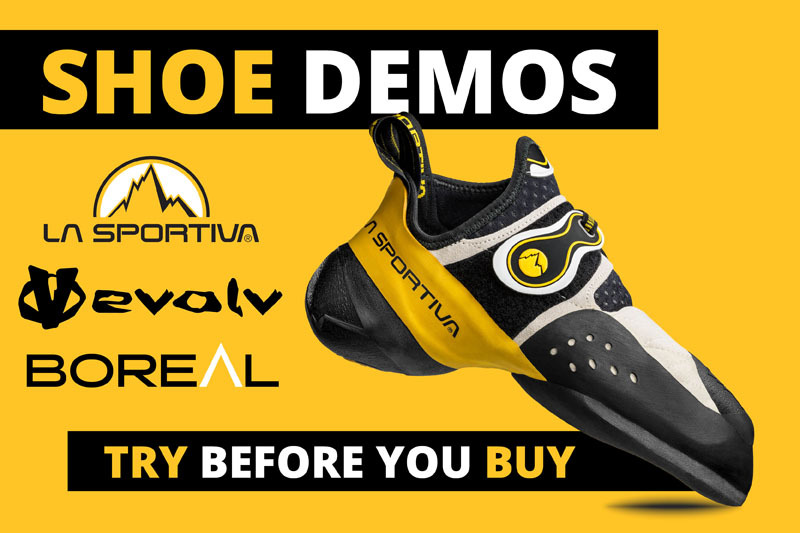 We’ve teamed up with La Sportiva, Boreal, and Evolv to offer demonstration evenings for each brand at Big Rock during the next few weeks. All dates start from 6pm. During each demo evening, you’ll be able to explore the range of footwear currently on offer from each brand and try different sizes and models in the best possible environment: by actually wearing the shoes during your regular climbing session. You’ll also find a brand representative on hand to offer expert fitting advice and technical guidance aimed at matching you up with the best shoes for you. Get the climbing buzz at Big Rock this Easter! We’re changing things up at Big Rock Hub this Spring! Get started with a Bouldering Induction & free Skills Workshops! Free Solo Film at The Film Place, Buckingham. Saturday 04 May. Big Rock Youth Climbing Competition. Friday 24 May. Big Rock Fun Charity Bike Ride & Buffet. Sunday 26 May.